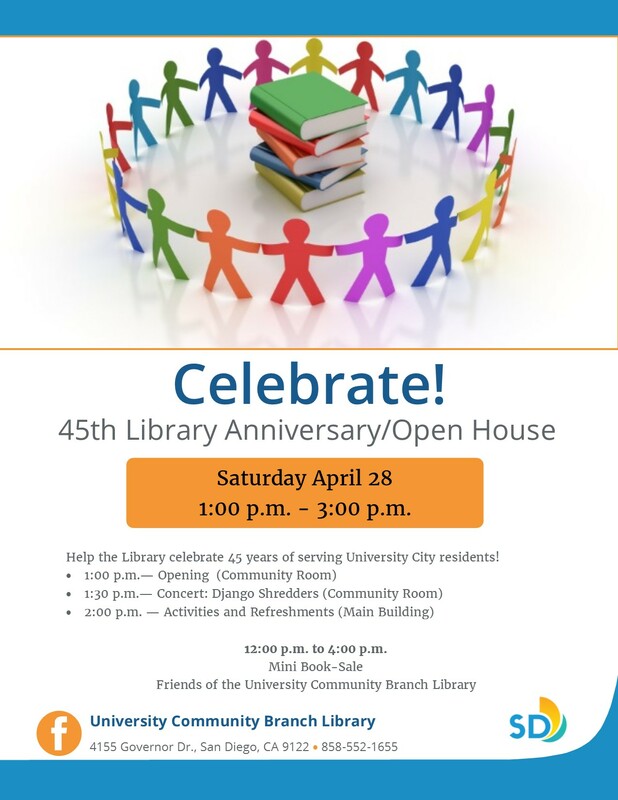 University City friends and neighbors are invited to celebrate the library’s 45th anniversary at an Open House on Saturday, April 28 from 1:00 PM to 3:00 PM at the University Community Branch Library, 4155 Governor Drive. Music and refreshments will be provided, along with fun activities, and a mini Saturday book sale hosted by the Library Friends. The first storefront library, the University Community Reading Center, was a temporary facility which opened in March 1973 to provide services to local residents until the permanent library could be built. Located in the UC Marketplace on Governor Drive at Scripps Street, the original library housed 5,000 books and was open 33 hours per week. 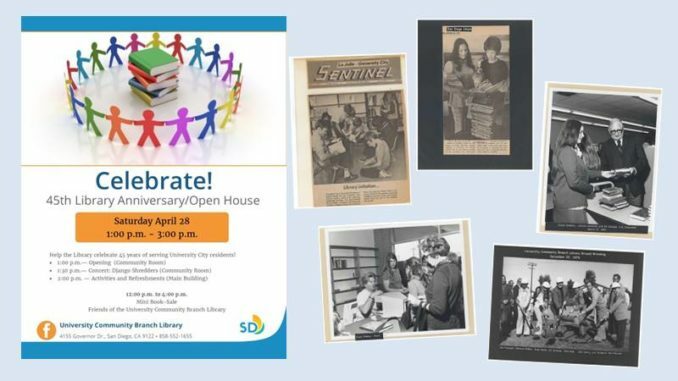 The permanent building, located at 4155 Governor Drive, was dedicated on April 10, 1978 by District One Councilman Bill Mitchell with Master of Ceremonies and Chairman of the Library Commission Hal Fletcher. Since then, the library has grown and changed in many ways. The library is now open 55 hours a week and has over 60,000 items in its collection. Computers and automation were introduced in the 1980s and ebooks and online databases came along in the 2000s. Both innovations have enabled users to enjoy library services at the touch of a finger without ever stepping into the building. Those who stop by the library will find plenty to do besides check out a book: read a newspaper or magazine, check out a foreign language DVD (Korean, French, German, Hindi and more are available), use one of the computers for research or to print out a resume. Patrons can even donate gently used books to the Library Friends book sales (and get a tax receipt). If you haven’t been to the library recently, come check out the monthly clubs and concerts, OASIS lectures, STEAM programs, crafts and storytimes for children, and UCCA community meetings. There is something for everyone. 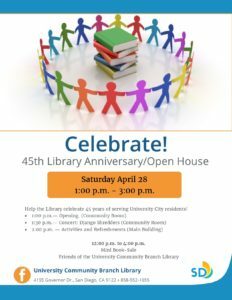 All who work and volunteer at the University Community Branch Library look forward to seeing you on Saturday, April 28 as we celebrate our library’s 45th anniversary Open House.